Nick names: (Pa) Jj, Monkey, Bowling-ball-head, and Tisoy (a Filipino term arising from the fusion of two words: mestizo [signifying members of the Hispano-Filipino or mixed breed society] and Pinoy, signifying the identity of the post-modern Filipino). Size: Size 3 diapers, 12-2y shirts, 10-18m jeans/shorts. He wears 1 or 2 shoe (He got a banana peeling toes so he wears the size 1 without socks). Hair: Very straight like his mama. Long dark brown. (I prefer to let it grow long and I don't have any desire to cut it though my mother argues that he's gonna look like a girl). Teeth: 8 scary teeth so far! The top 4 middle, and 4 itty bitty bottom. Favorites: Ice Age Series, Dora the Explorer, Little Tikes workhorse, bang his bowling ball head into everything, loves to snuggle with mommy all the time, and he wiggle his head when he hears Wiggle Wiggle by Dora the Explorer. Just dropping in from the hop to meet you and follow via GFC:) I am number 99, just one more and you can have 100 followers!!! Hi, new follower from the blog hop. Can I just say your baby is soooo adorable. Such a cutie!! How sweet is that picture with the santa hat! Thanks for linking up with us for Mommy Moments! She is 100% cutie ! Happy New Year! Thank you so much for linking up at NanaHood.com I really appreciate it! Your little boy is adorable! And you are right, he's getting big. My baby boys (twins) just turned 21 and they are six foot eight inches tall and where size 16 shoes! Enjoy....it goes sooo fast! Hi I found you through the Wordless Wednesday blog hop. Please stop by and say hi when you get a minute. Have a great week. Good idea to document all those things. Aww, little pretty baby. :) I'm your latest follower from the Train hop. Precious! I am a new follower, found you on An Aloha Affair Bloghop, glad I did! How cute! 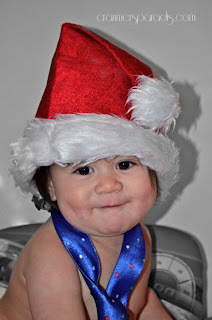 I love babies in Santa hats!